If you need roof repairs Edinburgh then working with a reliable and trustworthy company is vital. 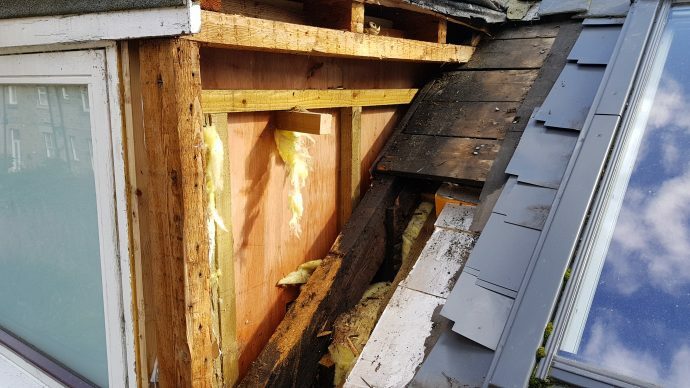 MGF Roofers Edinburgh is known for providing services of the highest quality at affordable prices, and roof repairs are something we specialise in. Roofers at MGF roofers Edinburgh know what they are talking about when it comes to roof repairs, and it's something we take quite seriously. We not only construct new roof systems, but our team of expert roofers are skilled in doing roof repairs to the highest standards. The weather in Scotland can be a little bit unpredictable at times, and we all know that when it gets a bit wet and windy from time to time, our roofs protect us from that harsh weather. Hence, it is important that roofing systems are repaired and regularly maintained to ensure that there are no leakages or damage to your roof after, particularly bad weather. If you are in need of a roof repairs Edinburgh specialist then our team will be happy to help. Both domestic and commercial roofing systems demand maintenance regularly and our team of roofers at MGF roofers are happy to perform any small or big repair that your roofing system will need. MGF Roofers Edinburgh has a wealth of experience and some of the most highly trained roofers to tackle any roofing problem. Our roof repairs Edinburgh specialists can provide roof maintenance and installation for new roofs and older roofing systems. If you have a roofing problem, call our roofers in Edinburgh today for help. We provide roofing repairs in all types of weather. We have experts to advise you which type of roofing system solution might be the best fit for you and your budget. We offer fast, effective and efficient services in roofing repairs to ensure that minimal damage is done in case of any emergency roofing problem. Even if it’s a minor fault or complete overhauling of the whole roof, we make sure that the work we do is of superior quality and displays the highest workmanship by our experienced and skilful roofers. Our company’s philosophy is to work on each client’s roof as if it is our own and this passion for high-quality roofing services shines through each project. That’s why whether it is small or big task MGF Roofers excel in every service and live up to your expectations and standards. Rope access is used for building access for small roof repairs. Though it is a cheaper and quicker alternative to scaffolding, it’s not always practical. That’s why we have experts at MGF Roofers Edinburgh who can guide you, free of cost, on whether it can be used for your work project or not. Call our roof repairs Edinburgh team of engineers today for a free no obligation estimate on repairing your roof, we are happy to help and normally minor repairs can be completed the same day.